Location - Around 50 metres down hill from Dol Tor stone circle. Head down hill through the trees from the circle and look to your left. It's easily visible in winter even from the circle. In summer it's not so visible and the way to it becomes a tangle of brambles. The stone itself stands around 1.5m high and around a metre wide on it's widest face, with a narrow top and a very wide base. 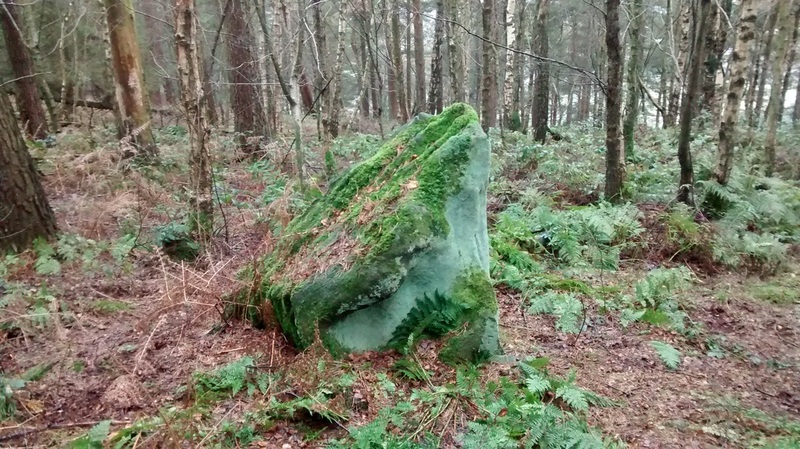 There are other large stones close by, some suggestive of a four stone alignment including this stone. I'm uncertain of age but the rilling suggests its been stood this way for millenia. Stu first pointed this out to me several years ago but as we visited in summer we couldn't really explore the area fully. Well worth a look if you're visiting the nearby circle.